As a food blogger, it’s plainly clear that I have a love affair with food. I simply adoreÂ food. 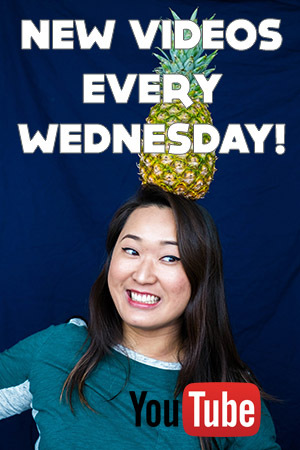 I have spent years of my life researching recipes, reading about techniques, trying new flavours, and I get irrationallyÂ excited when I meet other people whom are just as excited about foodÂ as I am. I love “talking shop” about baking chemistry, different cooking methods, and the wonderment of experiencing different flavour profiles and textures from various cultures and cuisines. I could talk about food for hours.Â But you know what I don’t get? People who don’t like food at all. People who just eat food for survival and don’t take any pleasure in it. That boggles my mind. That’s like not liking sleep.Â Why fuel your body with food you don’t care for? That’s like working just to get through the day. I’m a very passionate person, I couldn’t just grind through the day just to survive. What’s the point if all you plan to do is eat, work, sleep and repeat? I grew up around food. I connect with family over a huge spread of food. I unwind with friends over a meal at my favourite restaurants. Bad days are suddenly made so much better with a spoonful of comfort food (aka vegan mac and cheese). Food to me is a way of connecting with people and your culture through your tastebuds. Vietnamese weddings are a 10-course seafood ordeal. Long-weekends and family eventsÂ were spent at the beach with some long-marinated BBQÂ and freshly cut watermelon. 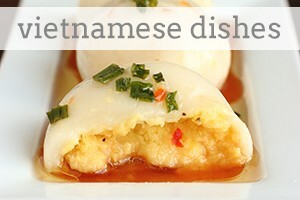 Vietnamese food is all about flavour. Slow cooked flavours that intermingle and highlight the natural flavoursÂ of fresh produce like lime, Thai basil, or culantro (yes culantroâ€”cilantro long leavesâ€”different from coriander), long-stewed flavours from star anise, cinnamon, ginger, clove, fennel, and onion. Meanwhile,Â so much of North American cooking focuses on the richness of butter and the classic flavours of salt and pepper. Pair that with the slow-roasting process of basting and dry roasting, North American cuisine features the satisfying crisp textures and fluffy interiors. Think Thanksgiving dinners, roast, potatoes, fish and chips, chicken nuggets… We’re a sucker for crisp outsides and fluffy insides. 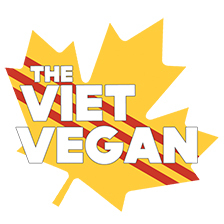 Today I address Vietnamese traditions of highlighting flavours through broth. This recipe is super, super simple, but what you need to do first is to make your own broth. You can do it over the stovetop, or even better in a slow cooker. Stovetop is faster; I made this broth in about 45 minutes covered on the element. But slow-cooked broth with have a deeper, richer flavour. A sweet base of onions, carrots, shiitake mushrooms (the $3 packages of dried ones from Chinatown I mean, not those $12 fancy ones), bay leaves is what I used for this. If you have leftover potato skins from all those holiday potatoes (whenever I peel potatoes, I freeze the skins and save them for a big batch of broth) you can reap all the nutrients from potato skins by simmering them into the broth. Then to make the soup, enrich the depth of flavour from the homemade broth with add a splash soy sauce, a dash of salt or granulated mushroom broth, and a sprinkle of red chili flakes. 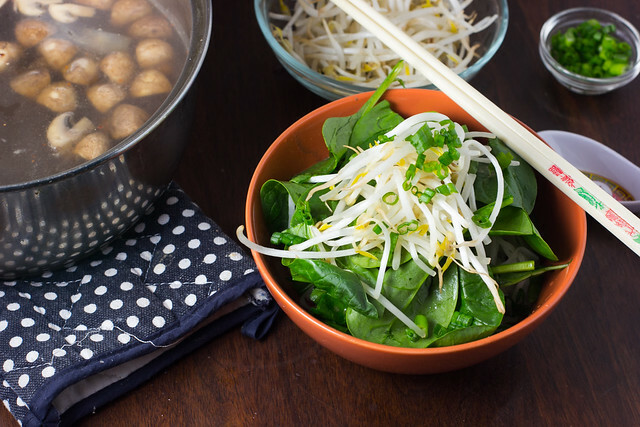 Then serve with my favourite things for soup: chewy noodles, wilted spinach, mung bean sprouts and green onion. Simple is good. The key to a good soup is the broth. So reap the Vietnamese tradition of extracting the deep, sweet flavours of root vegetables (since I’m not going to advocate stewing animal bones), and highlight it with deliciously fresh produce. My next post will address the North American traditions of crispy outsides and fluffy insides, because that’s fantastic too. 4 cups homemade vegetable broth , ideally made with a good base of onion, carrot, mushroom, and bay leaves. 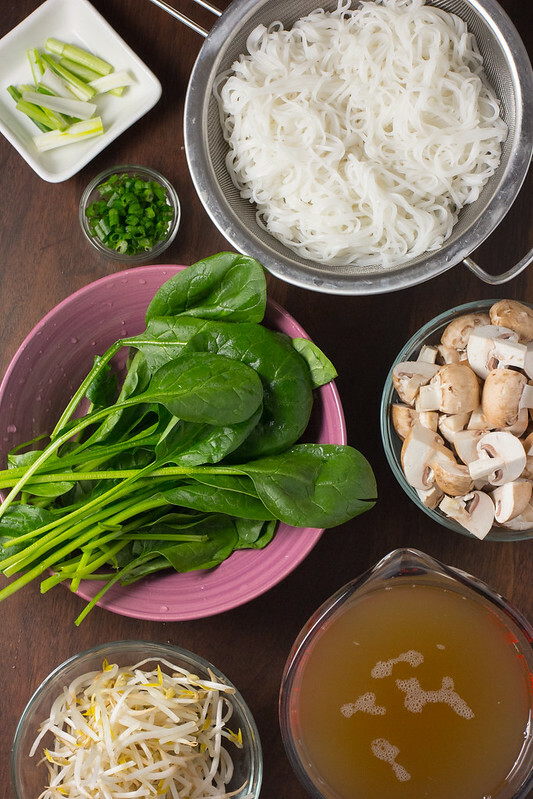 In a large pot of boiling water, cook pho rice noodles until "al dente". The should be almost completely cooked, but still have a bit of a bite to them so that they are perfectly cooked once you add to the broth. Drain and rinse under cold water. Separate into servings otherwise it will all stick together as one clump. Add spinach, beans sprouts, and chopped green onion on top of the servings and set aside. 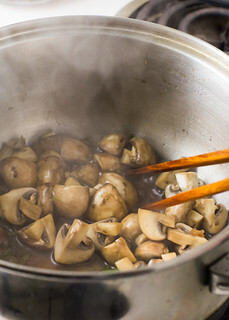 In a large pot, cook mushrooms in olive oil, white parts of green onion, chili flakes, and soy sauce until mushrooms have browned. Pour in vegetable broth and bring to a boil. Taste and adjust salt/add granulated mushroom broth. 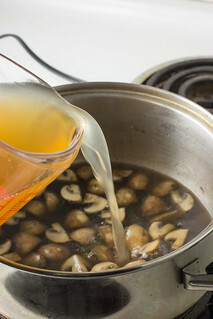 Pour broth over noodles in their respective serving bowls. 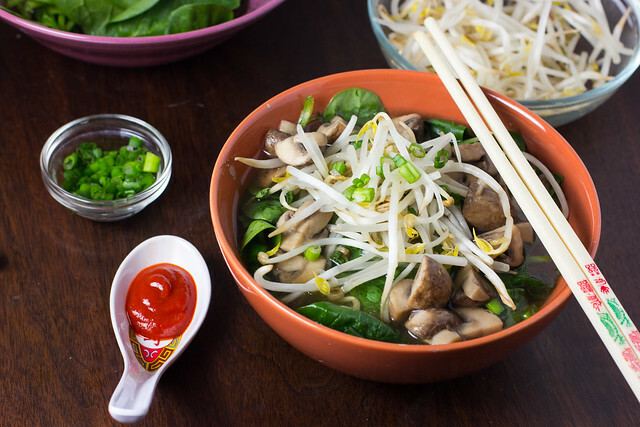 Add sriracha and hoisin sauce to taste and serve immediately. Thanks! It's filling but not in a oh-god-i-ate-too-much kind of way. Totally agree. They bring ramen noodles to a whole new level too. You should definitely make your own broth! It's so easy and saves so much money. I just use veggie scraps and an onion or two and I can make 2-3x the amount that a $3 1L carton would give me.